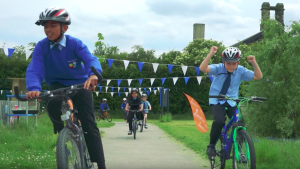 Do watch this inspiring little video from Sustrans, showing one Primary School’s bike revolution. Turns out kids can have fun and get free and healthy exercise at the same time. And reduce congestion and parking problems at school. Hayling’s schools support cycling, and our cycle routes to school are (slowly) getting better. Cycle Hayling wants to see kids on Hayling having fun and cycling to school. Wouldn’t it be great if by 2018 we could say that this video could have been made on Hayling! Sustrans is the Sustainable Transport charity that created the National Cycle Network, which includes the Hayling Billy Trail. Many Cycle Hayling supporters are also supporters of Sustrans. Previous PostPrevious Beat the traffic – ride to school or work!